For this week’s sample pile raid I’ve focused on premium red wines from McLaren Vale, including a whole swathe of new ’13 reds. Always interesting to look at a horizontal like this. Of particular note is how heavy some of said ’13 vintage reds look, with heat and drying tannins a constant element. A great Grenache year it looks like, if less so for Shiraz. 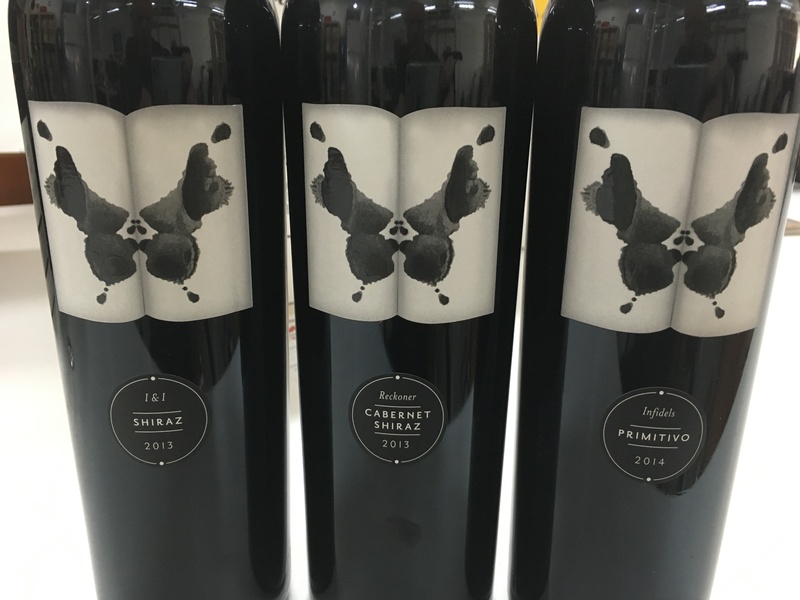 A special mention of the new Inkwell releases – right up at the pointy end of quality McLaren Vale reds at very fair prices. This is easily the most drinkable Zinfandel/Primitivo I’ve had from Australia. Ever. Handpicked and wild fermented, it was matured in 1/3 new American oak for 18 months. Always great to see technical numbers on a wine label and this has a TA 5.3g/L and pH 3.8. Maroon red in colour, this initially smells oaky, but gives way to a real smorgasbord of red and blue fruits, the palate following with lots of fruit and without the jam or heat of either Aussie Zin or many Primitivo. It’s still warm hearted, but that currants and berries fruit is on full and proud display. High quality wine. 18/20, 93/100. 14.3%, $30. Dub Style is winemaker Dudley Brown’s label for wines that are a bit different to the normal Inkwell format – and this is different. Sourced from 88yr old bush vines in the Bethany district of McLaren Vale, this is fermented with 100% whole bunches and matured in old oak. Light ruby but with just a little orange, it smells wild and whole bunch spicy, leading to a palate with a huge hit of tannins and briar, dotted with the sour cherry. Long, raw and demanding slow cooked meat, this is just a bit confronting, if intriguing – a wine to challenge. Challenge is good, but this won’t be for everyone. 17.5/20, 91/100+. 14.4%, $35. 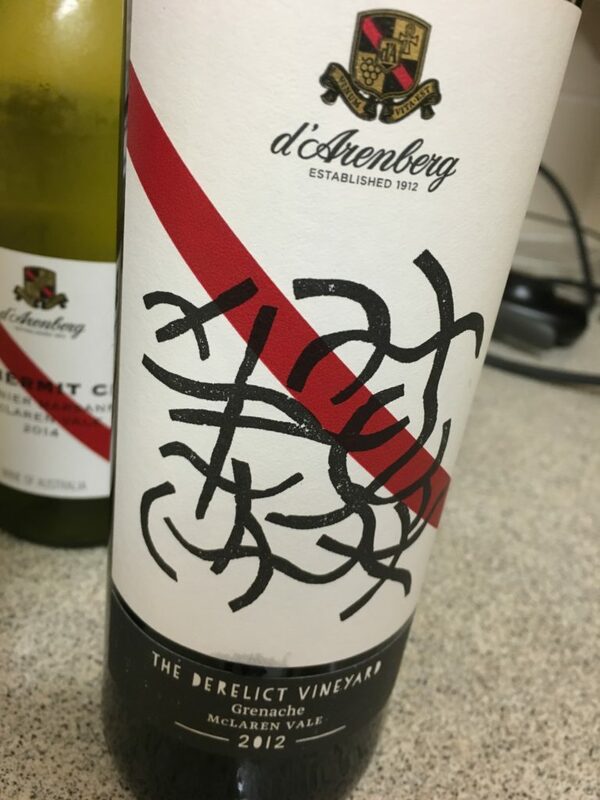 I like the new labelling on these d’Arenberg releases, with the quasi-Asian character (at first glance) label quite fun. This smells like a ‘d’Arenberg Grenache too, with its nose of baked brick, cooked plum and red earth. It’s very secondary, a little sour and mighty rustic, the tannins sticky and earthen, the palate very real and natural if less than pure. Technically it’s not perfect, but there is some earthy, hearty depth to this which makes it feel quite substantial. 16.5/20, 88/100. 14.2%, $29. This wine was made at Shaw + Smith, but its not Shaw + Smith. Nice duck egg blue label though. Bright purple juicy Grenache juice, it’s light and fun, all musky fruit, with a light finish. Plesant and simple, it lacks some concentration but not a bad little drink juicy drink. 16.5/20, 88/100. 13%, $26. Now in a lightweight bottle (good to see). Bright purple red, it’s amazing how much fresher and more vital this is compared to the ’12 Derelict Grenache. There’s still that red earth and red brick d’Arrys character, but this feels much fresher and less flat, the fruit noticeably aromatic, all red fruit aplenty, before a mid weight palate of juicy red Grenache fruit. Minimal oak and plenty of tannins make this quite satisfying in its easy form too. A welcome, juicy and vital wine, with a clear edge over the straight Other Wine Co. Grenache. 17.5/20, 91/100. 14.5%, $18. Available Feb 2016, which is sneaking up fast. I like how label and style match up here – Ironstone Pressings in name and ironstone pressings by nature… Dark red with just a little purple, the nose is heady meaty and inky, the very dry palate is extractive, firm, dried and just a bit bitter. There’s an awful lot of meaty, gritty, tannic and boozy flavour here, but it’s more of a frontal assault than a seduction. Still, those tannins are quite marvellous and there’s a perverse thrill in this wines structural attack. I’d rather like to see this in about 6-8yrs time as the potential for glory is high. Tricky wine to rate! 17.7/20, 92/100+. 14.4%, $54. Grenache, Shiraz and Mataro from three vineyards in two different McLaren Vale districts. A bright and juicy purple coloured number, with a juicy nose showing red fruits, black pepper and just a hint of bitumen, al lightened up by vanilla bean oak sweetness. It’s juicier than the nose suggests, with red currant and licorice, the palate packing a nice mix between fruit and savoury, red fruit with a dash of cured meat and dry finish. Indeed it feels quite substantial for a $20 wine, if just a little boozy on the finish. Great value. 17.5/20, 91/100. 13.9%, $20. 7% Viognier. That’s several percentage points too many for Vale Shiraz, which doesn’t need the V weed. Anyway, this smells like the d’Arenberg reds of a few years back (back when the wines look a little less clean), with black earth, truffle and black, earthy pastille fruit. It looks considerably older than 2010, bitter and meaty, the Bonox edges to the palate very savoury but also lacking in some juiciness. Has some intensity, but not quite convincing enough really. 16/20, 87/100. 13.9%, $30. A blend of 85% Shiraz, 15% Primitivo aged for 24 months in French and American oak. Numbers – TA 5.7g/L, pH 3.69. 14.1%. Immediately you can tell this is an Inkwell wine by the (inky colour) – deep purple maroon, the nose has compacted, wildly intense, licoricey black and red fruit in abundance. Indeed it tastes denser and riper than the other ’13 Inkwell Wines, with just some of the heavy ripe fruit characters of the vintage. It’s generous and full through the middle, with Christmas cake and blueberry fruit erasing any notion of over ripeness or excess. Commendably good for the vintage and has much to like about it. Could have rated it higher if it was just a little less drying on the finish. 17.7/20, 92/100. 14.1%, $26. Just how limited is limited release? A curious wine this, for Richmond Grove was historically always a Barosa/Clare brand. Medium red with purple edges the colour surprisingly light given the alcohol and vintage – clearly light extraction and pressed off early. 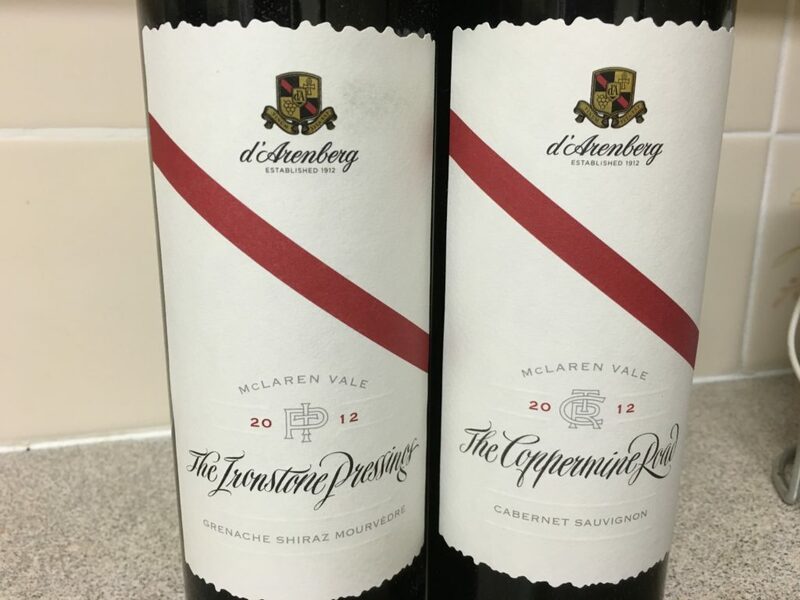 Coconut and chocolate on the oaky nose, the heavily coffeed palate has a mid palate McLaren Vale signature that is swimming in heavy toast oak and finishing with berry fruit and oak tannins. Licorice and chunky, it’s quite hedonistic really, with plenty of punch for a $22.99 red, if a little old school and oaky. 17/20, 90/100. 14.8%, $22.99. A tricky year for Shiraz, but handled well here by Wirra. Dark purple red, there is plenty of bitumen and coal dust, the palate thick by polished and just a little warm. Some nice black jelly bean flavours through the middle, if finishing with some of the slightly harder edge. Great concentration, it’s a smart warm year wine, even if I wish it was a little less warm to finish. 17.8/20, 92/100. 14.5%, $70. This was leaking after a damaged screwcap. Curiously it hasn’t hurt the wine though – it’s the best Dead Arm in years. The recipe here is all about old vines, foot treading, basket pressing and no racking until final blending. Dark red in colour, it has a deep, cocoa powder oak etched, thick black red fruit over a mid palate of rich, thick fruit, drying tannin and just a little of the tilled earth character of recent Dead Arm. Indeed this looks so much fresher than the wines in this lineup, the fruit geneorous and with little of the scorched fruit character of the other wines here. Indeed it’s quite more-ish and even savoury, the heat of alcohol the only real downer. Impressive! 18/20, 93/100. 14.6%, $65. The premium Inkwell Shiraz and in fine form here. Matured for 24 months in old French oak, the final numbers – TA 6, pH 3.64. Deep purple red, the nose showing plum and cocoa powder with serious richness. 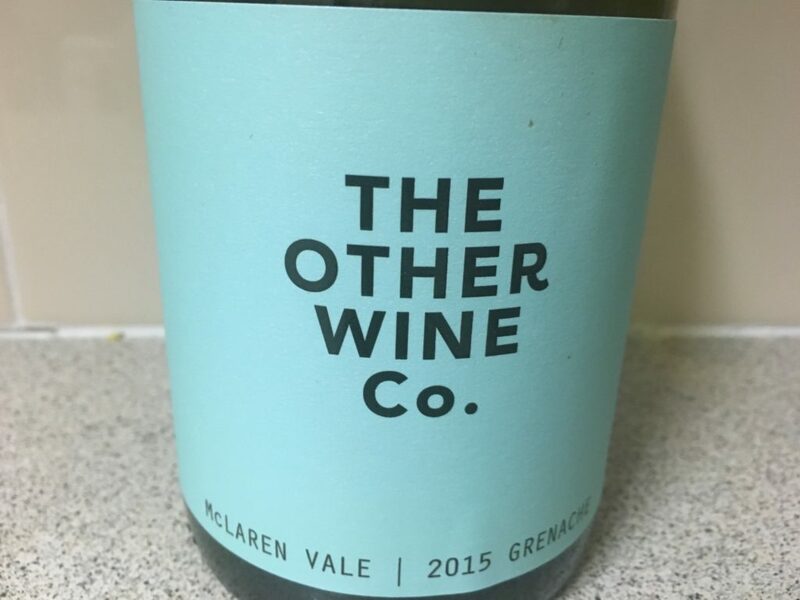 The best thing about this wine is the texture, with some of the bittersweet savoury character of long oak maturation but complemented by plum fruit, the overall effect something akin to a McLaren Vale version of a Rockford Basket Press (or maybe thats just me). Lovely powdery tannins finish everything off nicely, even though it’s very backward. A+ plus McLaren Vale red, and I can’t help but note the moderate alcohol. 18.5/20, 94/100. 13.7%, $30. In good form this vintage. Dark, purple. Masculine and firm this year, the edges tipped with dessication through fresher than the Shiraz. More McLaren Vale than Cabernet this year, though that flood of dark berry fruit is really quite enticing. Dark and sticky tannins suggest this brutish red should continue to develop with time in bottle. Brutish, but not over the top. Very good. 18/20, 93/100+. 14.5%, $70. Clearly ’13 was better for Cab than Grenache in the Vale. Thick skins no doubt helps, with Cabernet looking more lively in a warm vintage. Deep, dark red maroon with purple edges. Inky and bursting with dark chocolate and dark berry fruit, the chocolate and dark berry palate drenched in fruit, drenched in gritty sandpaper tannins and dark chocolate oak with a hearty finish. Bold and brawny, it’s a little porty on the finish but gee it packs a flavour punch. Meat and potatoes wine that should live forever. 17.7/20, 92/00+. How good are the Inkwell wines! One of the only Aussie Viogniers I’d drink myself too.